Greetings in the name of our Lord Jesus Christ. It is with great joy that we welcome you to take a virtural tour of the Praise Covenant Interdenominational Fellowship. This is a fresh move of God in uniting all of God's children regardless of denominational affiliation. It is the center-ness of Christ, which unites us in Praise, Purpose and Partnership. toward that end, prayerfully consider the following pages. This fellowship acknowledges the autonomy of the churches and denomination and welcome you to consider partnering with us. The Scriptures of the Old and New Testaments (The Holy Bible) were given by inspiration of God and the only sufficient, certain, and authoritative rule of all saving knowledge, faith and obedience. We accept the Bible as our infallible guide in matters pertaining to conduct and doctrine. We believe that God is the creator and sustainer of the universe who has provided humankind with a revelation of Himself through the natural world and through His Son, Jesus Christ. We believe that the Bible does not seek to prove the existence of God; it simply affirms His existence by declaring, "In the beginning God..." (Gen 1:1). God has revealed Himself through the physical universe (Ps 19:1; Rom 1:19-20). The greatest revelation of God comes through the Bible. Through this inspired written record, both the existence of God and the nature of God are revealed in and through Jesus Christ. Jesus stated, "He that has seen me, has seen the Father" (John 14:9). 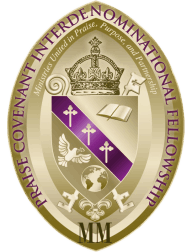 The purpose of the Praise Covenant Interdenominational Fellowship (PCIF) is to provide a broad range of spiritual, educational, and professional benefits to assist churches and ministries in fulfilling their respective roles to the Body of Christ. The major thrust of PCIF is to become a catalyst for the uniting of churches that will unite to create and deliver innovative programing to grow each church individually and corporately and to become recognized leaders and a valued asset in the communities in which we serve. We fervently desire to see that members are provided with the necessary tools to mature their individual call and purpose as a Christian. While we are not an eclectic organization and do not seek to dominate, or control the local assembly, we do desire the collective wisdom and sensitivity of God towards the Body of Christ as evidenced by our participants. PCIF does not seek to be an instrument of ecclesiastical restraint in the sense of diminishing the member church or ministry's unique existence, but rather to augment and enhance the member's individual calling and vision.